A new film showcases a couple’s love for their transgender daughter, with a religious twist: Teagan Widmer is the child of a Seventh-day Adventist pastor and his wife, and they are seen on camera discussing their struggle to accept and understand this revelation as well as reconcile it with their faith. Last month the Adventist church issued a statement on “transgenderism,” in and of itself a negative word that trans people object to, because it reduces the experience to a clinical term, as if it is an illness, to be treated. The statement, advising celibacy and suggesting trans Adventists await redemption at the Second Coming, is far less than the ideal the Widmers have expressed in their film by Stephen Eyer. “We would like the church to continue to grow and change and to become the community of Christ, where love is more important than law and people are more important than policy,” Teagan’s mother said. If their daughter’s name rings a bell, it might be because Teagan Widmer is the developer whose first app, Restroom Refuge, became a huge hit in the trans community immediately upon its release in 2014. The Widmers, who also have a younger daughter, Rebekah, said they are coming out in their own way through this film. In one of the moments in this film with which many LGBTQ people can identify, the Widmers revealed that they, too, were in a closet, locked in by the conflict between their love for their daughter and their religion. And they haven’t totally left that closet, either. “In some ways, the closet door is kicked wide open with this video,” the pastor told LGBTQ Nation in an email. “It is a big step to telling our greater church community,” he wrote, describing how they’ve been on this journey since 2012, when Teagan came out. We also “uncloseted” ourselves by attending 2 PFLAG meetings and by attending a Pride parade in San Francisco (as observers from the crowd). Do we still feel closeted sometimes? The answer is yes. 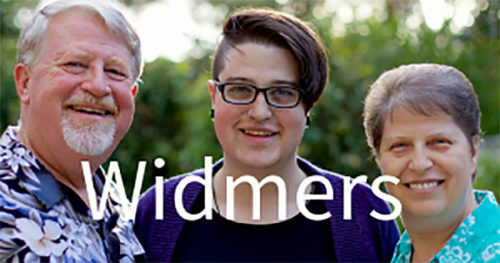 Widmer and his wife said that they have become activists of a sort, speaking at religious retreats, school board and summer camp administration meetings, participating in conferences and counseling seminars about transgender issues, and inclusion. They’ve also written about their experience in an article published Wednesday in the Spectrum magazine that serves the Adventist faith community. Some viewers might be triggered to hear the Widmers refer to their daughter as their son, or use his birthname, what many trans people call their “deadname.” They explain how they handle this rather matter of factly. This is an area where Teagan was very grace-filled to her whole family. There is no one in the family that insisted on using male pronouns or the old name. When her grandparents would still use a male pronoun or name, it was out of their brains using a 24 year-old speech pattern, rather than doing it out of spitefulness. When we have been in conversation with others, we allowed our friends “in the know” to express their awkwardness with the pronoun thing…and gave them permission to grow along with us all. Even today, we often tell pre-2012 stories using Timothy/he words and tell post-2012 stories using Teagan/she words. The Widmers are telling their story not long after a bisexual pastor announced her resignation after coming out. One of the most moving moments is how Teagan’s mom relates her own transition as the mother of a son to the mother of daughter, and what she described as a grieving process. Her husband told LGBTQ Nation he found it difficult to lead his congregation when it came time to sing hymns. It was hard to sing songs of God’s amazing grace… assuming that the church denomination I worked for would not have amazing grace for my trans child. I also assumed the local congregation I served would be split on the topic of LGBTIAQ inclusion, and so not wanting that… I was quite silent. I also locked down my facebook account. I unfriended about 150 people that I didn’t want to see pro-LGBTIAQ posts I might make and changed the settings so that only friends could see the details of my page. I resorted to comforting myself with evening snacking, having put on 30 pounds since then, and I would resort to mind numbing TV viewing, staying up way past a reasonable bed time. A positive grief coping strategy was writing poetry. It was most helpful in coping with my own grief and nudging me towards saying goodbye to Timothy… so I could consider including Teagan. Widmer said he found positive feelings in doing familiar things like baseball games and a cross-country road trip when she returned home from graduate school on the East Coast. Widmers – Outspoken from Stephen Eyer on Vimeo.